Fifteen years ago, hit man Tyrone Cypher disappeared into the wilderness. Now he’s back with a job for his old “friend” Jack. While Jack doesn’t consider Cypher much of a friend, the job is ideal for Nadia. There’s a killer in Honolulu, targeting those involved in the family court system. When no one else would take one victim’s cases, lawyer Angela Kamaka did, putting herself squarely in the killer’s cross-sights. For those who’ve read the Rockton series, yes, this is Tyrone Cypher from that series, making this a crossover story. Perfect Victim takes place about five years before Cypher appears in A Darkness Absolute. 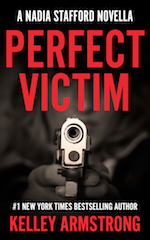 Double Play and Perfect Victim are combined in a paperback edition. You’ll find links for that below.